On these pages of the Kordon family there is information about the name, an insight into the state of genealogy, hints to ancestor trees and personal reports and an archive of annual Christmas newsletters. I try to keep the information up to date and I constantly beg your indulgence if I do not always succeed. Since this chapter is only interesting for family members, the access to some sections is protected. Whoever has a reasoned interest to visit these sites, can ask for the password by e-mail. 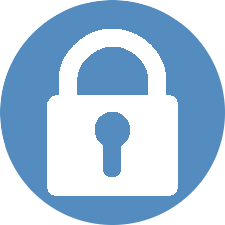 The protected sites are marked for clarity with a padlock icon. On the Origin of the name KORDON there are different theories. The first theory of derivation comes from the French. Here Cordon means string, cord, rope. For the origin of our name this explanation is unlikely because there is no evidence that the family is originally from France. French name came mainly through the Huguenots to Germany. But these were Reformed Christians, while the family Kordon consistently (except for a few exceptions, known for their conversion ev. Church) is Catholic. The second explanation leads to Spain. Kordon may be derived from Kordewan, goatskin from Cordoba, or the shoemaker who processed this leather. But this explanation is unlikely for our family, as there are no indications that lead to Spain. Also the theory that the name is derived from the English name "Gordon" is not supported by any evidence. Most authors (so Linnartz: "Unsere Familiennamen", GOTTSCHALD: "Neue Namenkunde") are derived our name from the first name "GORDIANUS". This first name was often until the 2nd World War in the Allgäu, today he comes only occasionally. In Württemberg the name Cordon was formed from the first name. In fact, the name Kordon there was initially written with C (1700). But already in the next generation it was written with K.
GORDIANUS is Latin and means "of from Gordium". Gordion or Gordieum is located in Asia Minor in the former Phrygia in the kingdom of Alexander the Great (300 to 200BC). Today it's the Turkish Anatolia, west of Ankara at the river Sangarios (now Sakarya) on the Persian King Street. Gordianus (Lexicon for Theology and Church, Bd.IV, S. 1056, Herder 1960) have been a high imperial official who had died under Julian the Apostate, and was buried in the crypt of Epimachus who had suffered some time ago in Alexandria martyrdom. Under the reign of the emperor Julian the Apostate (361-363), the nephew of the Emperor Constantine, it was tried to enforce the old state religion again by removing Christians from influential government agencies and by rebuilding the ancient temples again and opening them. Then the imperial Vicar Gordian commanded to keep the old Januarius in his own home into protective custody. At night talks and teachings Januarius succeeded to convince his judge of the truths of Christian doctrine. Gordian and his wife Marina were baptized, along with 53 members of the household. The gilded bronze Jupiter portrait that graced the family altar, Januarius melted. I have done that more for the welfare of the state, because if I would have all the idols man-made, I would them break up and melt, for whom you call more worthy of worship, the Creator or the creature? But I pray to the One who made everything. Gordian suffered his martyrdom in Rome in front of the temple of the earth goddess Tellus by decapitation. Members of his house system and other Christians hid him and brought the corpse in a catacomb on the Via Latina, where Epimachus had been buried the day before. Benefactions and miracles occurred at the burial site. There a small church was consecrated for them. Already the early martyrologies celebrate the day of the martyrs on 10th May. According to legend, the empress Hildegard (757-783), wife of Emperor Charlemagne and descendant of Alamannic Dukes, brought the relics of the two saints Gordian and Epimach from Rome and passed them to the convent of Kempten (Allgäu). Gordian is shown as a knight, Epimach in genteel clothes with cross and nail. Depictions of the two saints in the visual arts are extremely rare. They can be found as assistant figures at the high altar in Dietersheim near Bingen, created in 1510, and at the high altar of St. Lorenz in Kempten, from the 18th century, as well as on other paintings and frescos of the former Abbey of Kempten. The story of the Saints from "The Catholic Encyclopedia, Volume VI"
Martyrs, suffered under Julian the Apostate, 362, commemorated on 10 May. Gordianus was a judge but was so moved by the sanctity and sufferings of the saintly priest, Januarius, he embraced Christianity with many of his household. Being accused before his successor, or as some say before the prefect of the city, Apronianus, he was cruelly tortured and finally beheaded. His body was carried off by the Christians, and laid in a crypt on the Latin Way beside the body of St. Epimachus, who had been recently interred there. The two saints gave their name to the cemetery, and have ever since been joined together in the veneration of the Church. There is another Gordianus who suffered martyrdom (place uncertain) with two companions, and commemorated 17 September (Acta SS., XLV, 483); and a third, commemorated on 13 Sept, who with several companions was martyred in Pontus or Galatia (Acta SS XLIV, 55). There are also several martyrs named Epimachus, and, owing to the meagreness of the information possessed concerning them less careful writers have confounded them greatly while the greater hagiologists are unable to agree as to their number or identity. The Bollandists mention five saints of this name: A martyr commemorated by the Greeks on 6 July, (Acta SS., XXIX, 280); (2) Epimachus and Azirianus martyrs venerated by the Copts and Abyssinians on on 31 Oct., (Acta SS., LXI, 684); (3) Epimachus of Pelusium in Egypt, venerated by the Greeks on 31 Oct. (Acta SS., LXI, 704); (4) Epimachus and Alexander, martyred at Alexandria in the persecution of Decius, commemorated in the Latin Church on 12 Dec.; Epimachus whose body with that of St. Gordianus, is honoured at Rome on 10 May. Most of the great writers have denied the existence of an Epimachus martyred at Rome, and account for the relics honoured there by asserting that the body of the Alexandrian Epimachus was transported thither shortly before the martyrdom of St. Gordianus Remi de Buck, the learned Bollandist, however, maintains that the evidence for the Roman Epimachus is too strong to be doubted, while he rejects the pretended translation of the relics of Epimachus of Alexandria. At most recent findings the Württemberg part of the family comes from of a merchant who immigrated from the area around Venice / Italy to Ellwangen. Also in Italian means Cordon cord or rope. Should the professional title of a rope maker be the origin of our name? However, whether other, not yet assigned family parts date back to the Württemberger and whether the name has developed in parallel in different places, still remains unclear. It always has been the very big interest of Mechthild Kordon at genealogy. Probably it was awakened by the research activities of her father. He began long before a pedigree certificate was required in the Nazi period to do research in his own family. As Mechthild met her husband Josef Kordon and his family (1959), she wanted to know more about her new family. So she asked her father-in-law Max Kordon off after the Kordons and let herself show and tell his rescued documents and photos from Silesia. 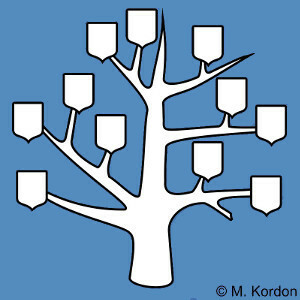 With these first data Mechthild Kordon began compiling a family tree. She noted that it would actually be a great relationship. But she knew only a few people! Where are they all gone? Where and how research has been done? First Mechthild Kordon began with her husband Josef Kordon and their children to scroll phonebooks for the name KORDON. That was very difficult, especially when you consider that there were more than 40 phone books alone in the former federal territory. Today, however, the search for a name with the digital phone books, a CD for the whole of Germany, or on the Internet is very easy. Unfortunately there is no longer every phone owner in the directory because there is no obligation for an entry. One day the genealogists learned by chance that the Mormons (Church of Jesus Christ of Latter Day Saints) operate genealogy for religious reasons and all church records, civil status and other registers achievable for them have been filmed. These films are kept in Utah / USA in an underground archive in a granite rock. The family closest genealogy site of the Mormons was at that time in Wuppertal-Barmen. They had luck. The church records of Upper Silesia are filmed. So they could ask for the films of the church books of Klein Pramsen and studied them in Wuppertal. The church books of Klein Pramsen were filmed up to and including 1840, for privacy reasons, unfortunately not further. Family Kordon looked through all the entries and wrote out, in which the name Kordon occurred. At home everything was then sorted and analyzed: a large kinship panel was created. This panel unfortunately contained and still contains many gaps and question marks, especially in the continuation after 1840. Whether once the gaps are closed and the question marks can be eliminated, is uncertain. So they are pleased about every new puzzle piece that fits into the Panel. The second focus of the research is in Württemberg, since here too the name Kordon can be found. Here the researchers were able to rely on some pre work done by Gerhard Kordon. Visits of registry offices and parishes brought new data that could be incorporated into the Württemberger Kordon panel. A connection between the Silesian Kordons and those from Württemberg has not yet been found. The most recent researches are targeted researches by individuals or family branches, which arise from references from family members. Occasionally a "new" interested Kordon gets in touch via internet and gives important hints, which will help to close the gaps in the now respectable family boards. Great help Markus Bolz has thereby done, who could prove the connection of Kordons to Austria and the origin of the Württemberger from Italy, the Greater Venice, by his targeted research in Nenningen. Also in future Mechthild Kordon and her son Matthias like to take hints to names, origins and other family members. We answer inquiries with reasoned interest likewise gladly. The contact is possible via the webmaster of this site. The result of the family research is a very extensive collection of data and reports from the various branches of the family. The personal pages, ancestor trees and statistics created with the Software MacFamilyTree are no longer available online for privacy reasons. The various possible representations of the total of more than 1650 recorded persons have become very complex. It therefore makes more sense for me to prepare it individually for interested family members. In any case, the wealth of information has made it difficult for me to keep content online up to date. The latest data is available on request still offline with me. Please feel free to contact me for inquiries, additions or corrections by e-mail: . Many thanks for your understanding and support. 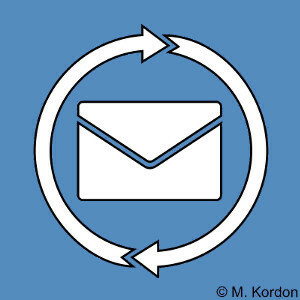 Since 1985 Mechthild Kordon from Wilnsdorf writes a circular letter to the Kordons every year at Christmas time. This includes interesting reports on the progress of genealogy. Also an interesting section are the informative family news about events in the family. Especially the latter heading thrives on information provided by interested Kordons. Please send further messages to Mechthild Kordon, In Steinkaute 6, 57234 Wilnsdorf, Germany. Here in the archive you can read all previously published newsletters as PDF document. The original language is German but some are translated into English. Simply click behind the year of publication on the wished language button. Please note that you will need an access code to view the annual newsletters in the protected area. On reasoned interest you can receive this from the webmaster.